Soni S.H.S. Wolf, a founding member of Dykes on Bikes and an inspiring mother of the movement for lesbian pride and dignity, passed away of natural causes on April 25th, 2018. 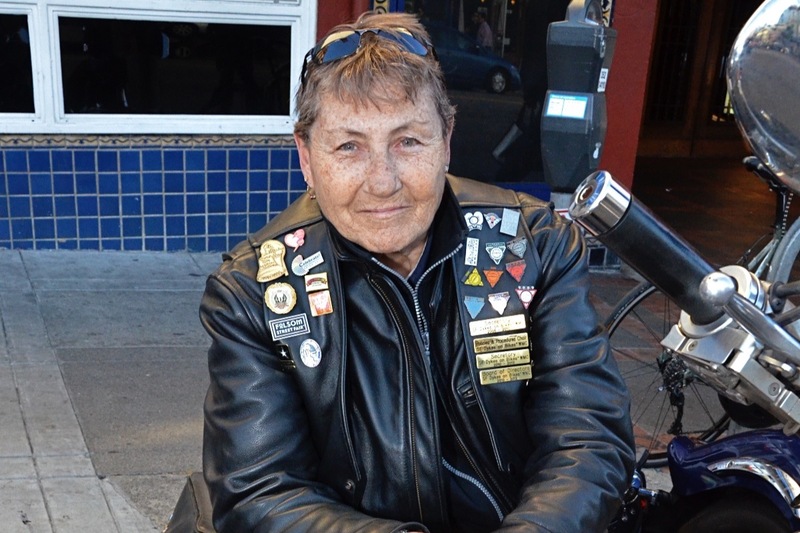 As a founding member of Dykes on Bikes®, Soni began riding with her sisters in the SF Pride Parade in the late 1970s, shortly after the movement for women’s empowerment and visibility brought Dykes on Bikes to the parade’s front. The window-rattling rumble of hundreds of motorcycles carrying decked-out dykes down Market Street exploded globally, with Dykes on Bikes chapters now leading LGBTQ parades around the world. During the 40+ years that Soni has been with Dykes on Bikes, she helped the organization evolve into a 501(c)(3) non-profit, spearheading the group’s mission to create a national and international community of women motorcyclists supporting philanthropic endeavors in LGBTQ communities. Soni mentored many Dykes on Bikes, was a steadfast leader in the LGBTQ community, and in 2016 was Sainted by The Sisters of Perpetual Indulgence®. She was a proud veteran of the United States Air Force. Soni moved to the San Francisco Bay Area in the 1970s, never imagining she would find herself an advocate and leader in a historic movement for equality. The iconic imagery, words, and legacy of Dykes on Bikes would not be what they are today without Soni Wolf. The Soni Wolf Memorial fund has been established for those wishing to contribute. Soni was the Dykes on Bikes’ longstanding secretary and historian, and in 2016 was granted Secretary Emeritus status. Soni’s wish was that the documents and materials with historical significance to the Dykes on Bikes and larger LGBTQ community in her care be archived and the fund will be used in part to support those efforts. No more than 20% of this fund will be used to offset costs of the memorial services for Soni. 80% of the funds will be used to support the archiving of materials with historical significance to the Dykes on Bikes and larger LGBTQ communities. Donations to the Soni Wolf Memorial fund established through the Dykes on Bikes are tax-deductible.